Skaters were ready to race and roll !!!!! this race went BIG! Let's go! (We had quite a few DNS for various reasons, sigh but those who raced had a blast) There skaters coming from as far away as Germany for this race! 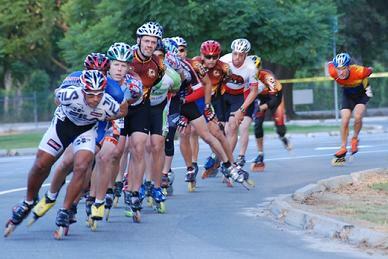 There are skaters coming from 3 different states from all over the USA for this race too! There will be some really fast skaters, as well as some of the local pro skaters have said they will be at the start line! There will be all levels of skaters will be at this race! Are you pre pre registered yet, NO? Well are ya waiting for then????? OK joking aside the word pre reg. must have been heard by the skaters. The race morning weather was perfect not hot not cool, with a very light breeze blowing, clear skies and skaters ready to race! We started the race with the Star Spangled Banner then a few brief words and a quick check of the start line, to make a few skaters roll back a few inches behind the line (no jumping the line)! and they were off! What a great start, you could here the slap of the wheels on the ground and a few seconds later quiet, ya quiet. Till 6 minutes later when the first pack came by, like thundering horses at 24-26 mph! They were pulling strong, with the second pack just behind and a few minutes later the next pack then they rest strung out, add a few more laps to the race and there was a short change in the dynamics and the packs were restrung again. Roll up to 40 plus minutes the first pack went through the line, it was soo ooo cool, arms and legs flying and the rush for the finish line. I could not find my camera but thank Goodness Jonathan Kent (aka Chaio Bello) and ROOOOger Olson (aka Teflon Man)! And Mike Chevdden (aka Orange Chevy) had cameras! Then it was a quick review of the results and a light lunch, ya food after the race then the auction, which was way fun! some cool looking trophies and placement medals. Then on to the fun on the 123 podium stands, with lots of clapping and yahoos from all! See ya next year at the start line Oct. 3, 2010!